WASHINGTON -- US President Donald Trump took out his anger on South Korean President Moon Jae-in as he pummeled the trade and security relationship between the allies, according to a book released Tuesday. Trump and Moon spoke by phone on Jan. 19, one day before the US president marked his first year in office. In that conversation, Trump told his South Korean counterpart that he wanted to send a letter terminating the South Korea-US free trade agreement, and demanded payment for the deployment of a US missile defense system to South Korea, according to journalist Bob Woodward's new book, "Fear: Trump in the White House." "You guys are ripping us off," Trump was quoted as telling Moon. "I'm done just giving you guys free money!" 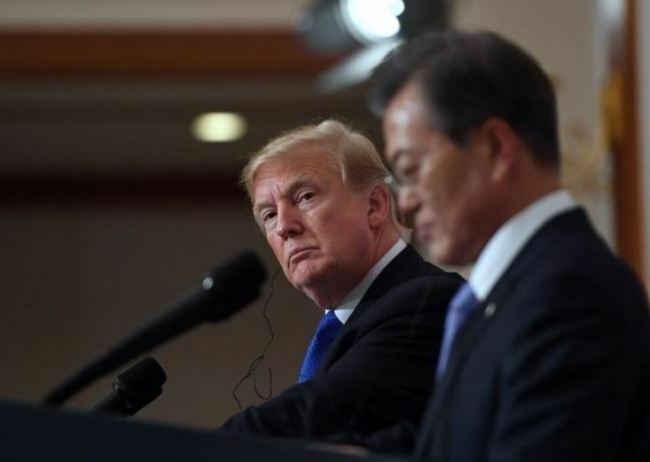 Not only did Trump dislike Moon, he had an obsession with the $18 billion trade deficit the US had with South Korea and the $3.5 billion cost of stationing 28,500 troops in the allied nation, Woodward wrote. "Moon replied that trade and security were intertwined," according to the book that gripped the White House even before its release. "We want to work with you, the South Korean president said." "You've got to pay for the THAAD anti-ballistic missile system," he was quoted as saying. "Why do we need to have any of our anti-ballistic missile system there?" Trump's then national security adviser, H.R. McMaster, called a meeting of the National Security Council the same day to discuss issues related to South Korea. It involved the president and key officials, including then Secretary of State Rex Tillerson, Secretary of Defense Jim Mattis and Joint Chiefs of Staff Chairman Joe Dunford. At the meeting, Trump demanded to know what the US got in return for keeping troops in South Korea. Mattis explained that South Korea was "a stable democracy in a part of the world where we really need it." He went further to say, "We're doing this in order to prevent World War III," casting a silence over the room.